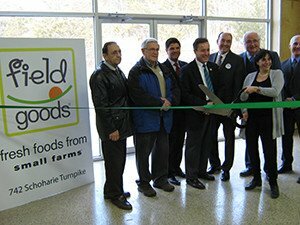 Field Goods founder and president, Donna Williams (a former investment banker and business development consultant with an MBA from Columbia University and family roots in Greene County), in her opening comments at the ribbon-cutting for the new facility, noted that the business just had its biggest sales week ever, delivering 2200 bags of produce from small farms to its subscribers. The business offers weekly deliveries of fresh local produce to consumers at two types of delivery locations, private sites (generally workplaces) and open-to-the-public sites (such as gyms or libraries, where anyone can stop by to pick up a bag). Group deliveries help the operation keeps prices low. Four sizes of fruit and vegetable subscriptions are available, at a cost of $15, $20, $25 and $30 per week for (1) fruit and vegetable subscription, designed for one person; (2) fruit and vegetable subscription, designed for 1 to 2 people; (3) fruit and vegetable subscription, designed for 2-3 people; and (4) fruit and vegetable subscription, designed for 3-5 people, respectively. Field Goods has been successful in marketing its delivery of fresh food to employers as “a valuable wellness program and employee benefit.” A creative 10-week program, priced as little as $50 per employee, includes the weekly delivery of 6-8 local produce items, a weekly educational newsletter, and an introductory group presentation. 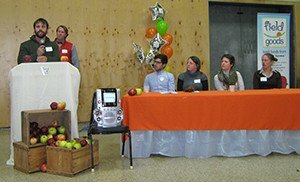 Also of value (in addition to encouraging employees to improve their diets) is the support demonstrated for small farms and sustainable agriculture by participation in the program. During the week of January 25th in the darkness and cold of winter (when Field Goods had its biggest week ever), the following small farm, local products were delivered to subscribers (in all bag sizes): frozen broccoli and fresh brussel sprouts from Shaul Farm, frozen sweet corn from Dustry Lane Farm, carrots and fingerling sweet potatoes from Juniper Hill Farm, and fuji apples from Yonder Farm. In small, standard and family bags, these additional items were included: greenhouse grown mix of crisp red and green romaine lettuce, kale, spinach, tatsoi and komatsuna from Radicle Farm and red onions from Minkus Farm. Subscribers had the option to include in their food bags for the late January week, at an additional cost, the following items: rosemary, leeks, Asian pears, mozzarella cheese from R & G Cheesemakers, bread from Bread Alone, fresh pasta from Knoll Krest Farm and yogurt from North Country Creamery. 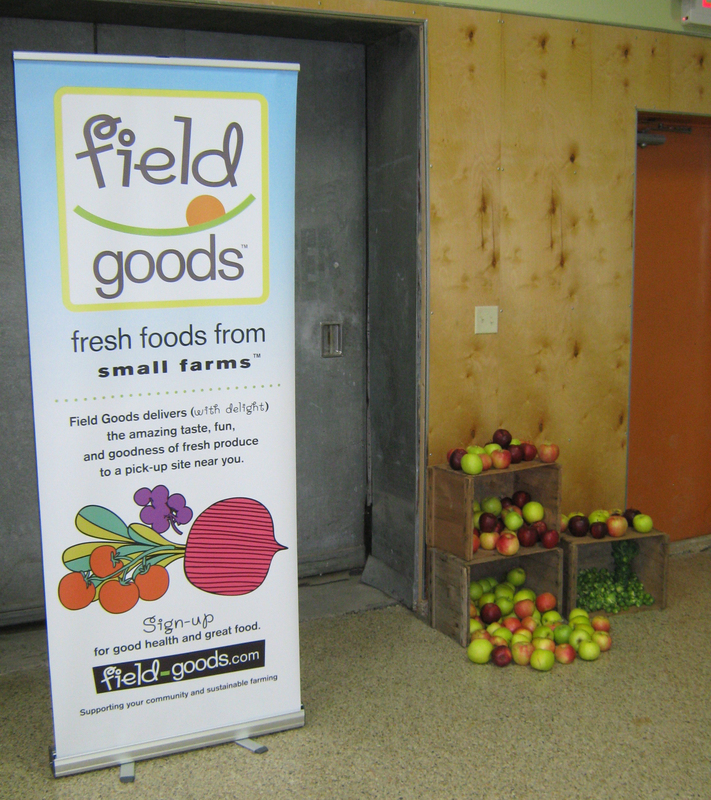 On its website, Field Goods notes that “our farmers use a variety of farming methods, all of which are designed to produce the most nutritious, delicious and sustainable products possible.” Specific information is provided to consumers showing whether the particular product in the weekly bag are either certified organic, organically grown but not certified, IPM (Integrated Pest Management), or conventional small farm methods. For example, in the bags delivered during the week of January 25th, the fingerling sweet potatoes and greenhouse mix were noted as certified organic, the frozen sweet corn was IPM, and the other products were grown with conventional small farm methods. Special mention should be made concerning how Radicle Farm, in the upstate city of Utica, by growing greens, on 16 acres under glass, has helped to create a substantial economic presence in a post-industrial, small rust-belt city. 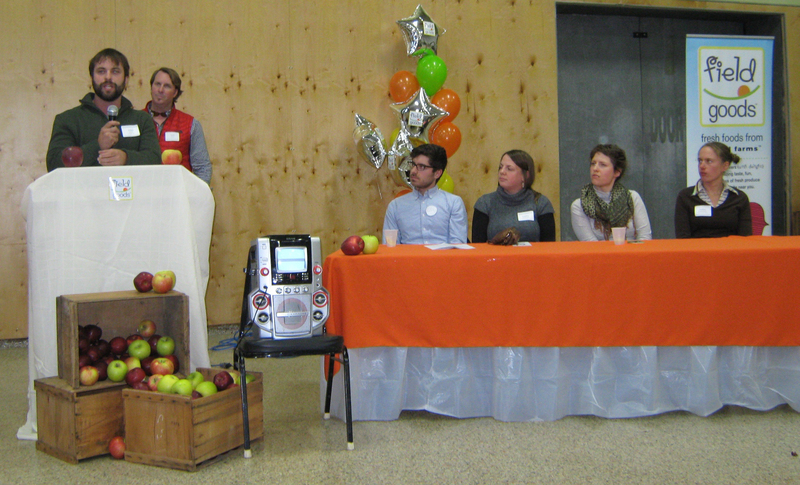 Present at the ribbon cutting were state and local lawmakers, as well as writer Molly O’Neil, a former New York Times food columnist who shared information on the Long House Food Revival (known as the Woodstock of Food), cooknscribble (an online teaching platform for food media professionals), and her current involvement in the revitalization of the small, rural village of Rensselaerville (Albany County, NY), as well as Modern Farmer editor Sarah Grey Miller. 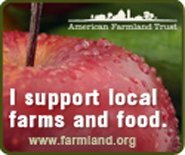 O’Neil made introductory remarks for a roundtable discussion by a panel of farmers, which was moderated by editor Miller and Todd Erling, the Executive Director of Hudson Valley AgriBusiness Development Corporation based in Hudson (Columbia County, NY). Topics ranged widely and included (i) food safety, (ii) utilizing the CSA model to support the economic sustainability of farms, (iii) the need of more traditional farms for migrant labor and (iv) GMOs. 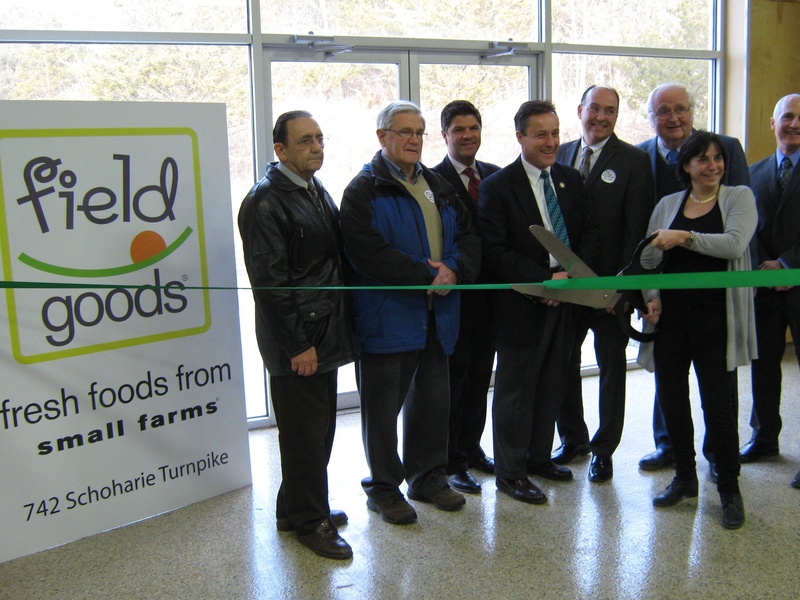 The outpouring of support for Field Goods from Greene County and neighboring Hudson Valley communities demonstrates the appeal of an enterprise that has the potential to stimulate economic activity in a geographic area (as well as improve the diets of consumers). According to an insightful report prepared by Dr. Rebecca Dunning, the Project and Research Coordinator for the Center for Environmental Farming Systems at North Carolina State, numerous studies indicate that fruits and vegetables produced and consumed locally create more economic activity in an area than does comparable food produced and imported from a non-local source. Perhaps this is obvious, but the reach of the increased economic activity may not be so simple: in addition to income generated directly by farm sales or at nearby farmers markets (or in the case of Field Goods by a creative entrepreneurial business providing a consumer market for 50 small, local farms), income is also generated locally from “induced income that results when money that is retained in the local system is re-spent locally.” Further, the resulting increases in employment, from the local production and consumption of food, supports and sustains “small family businesses engaged in building the entrepreneurial culture of a community” as noted in Dr. Dunning’s report. As a closing note, the words of farmer/panelist, Faith Gilbert of Letterbox Farm, are worth repeating: “How lucky to be farming at this time when there is so much excitement about local food.” We echo that spirit of hope for the future of American agriculture.